Give yourself an oasis outside your own home. Paving stones define beauty, elegance and durability for driveways, pool decks, walkways and patios. A properly installed paving stone driveway by Mansfield Landscaping won't crack, sag, shift or separate. It will keep looking fantastic for generations, and if it ever becomes stained or marred by paint or oil it can be repaired quickly and easily. Individual stones can be replaced with matching ones so that the surface looks exactly as it did before the accident occurred. This is impossible with any other type of pavement. The huge range of colors and patterns available makes customized design possible for any type of courtyard, patio, deck, or driveway. 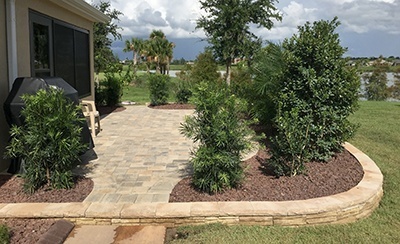 Mansfield Landscaping will work with you to create the perfect match for your project, whether it is patio pavers for your deck or a complete landscape design to complement your new paving stone driveway and walkways.